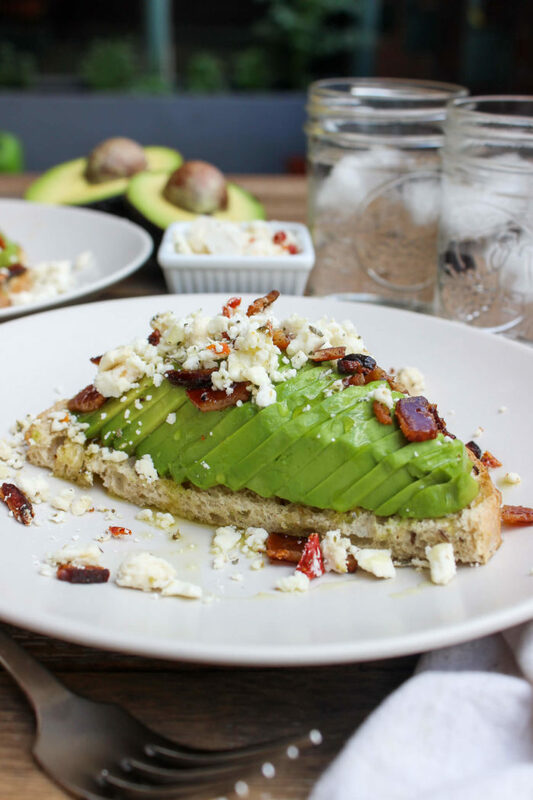 Does the world need another avocado toast? But does societies insatiable appetite for avo-instas practically demand that I make you another one?! My typical avocado toast is a simple mix of avo + lemon juice smashed on crisp rye bread. It’s fresh, it’s easy, and it’s GREEN, so clearly I get thinner while eating it. But sometimes I crave a little something extra from my avo game, and frankly I’m starting to resent paying $16 for it. So I decided to make MY OWN amazing, delicious, totally unnecessary avocado toast. And my guess is that you’re going to be hooked by bite three. 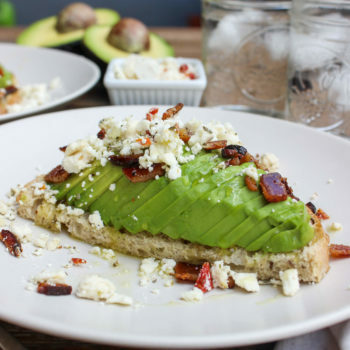 The gist here is to marry avocado (duh), cheese (uh-huh), and bacon (YUP!) on one little slice of bread. Now I know this might raise an eyebrow in the “health” department, but take a breather. 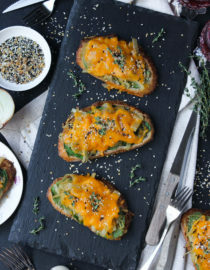 This is a splurgy, hangover-approved toast that’s perfect for the weekend, particularly if you’re brunching. 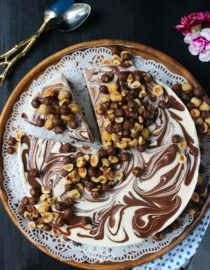 So grab a mimosa, pop some Advil, and make this! You’ll feel better in no time, promise. Feta is a great cheese to experiment with because it’s sharp without being too sharp. The flavor is pronounced, the texture is bold, but it’s still mild enough to pair with any number of dishes. 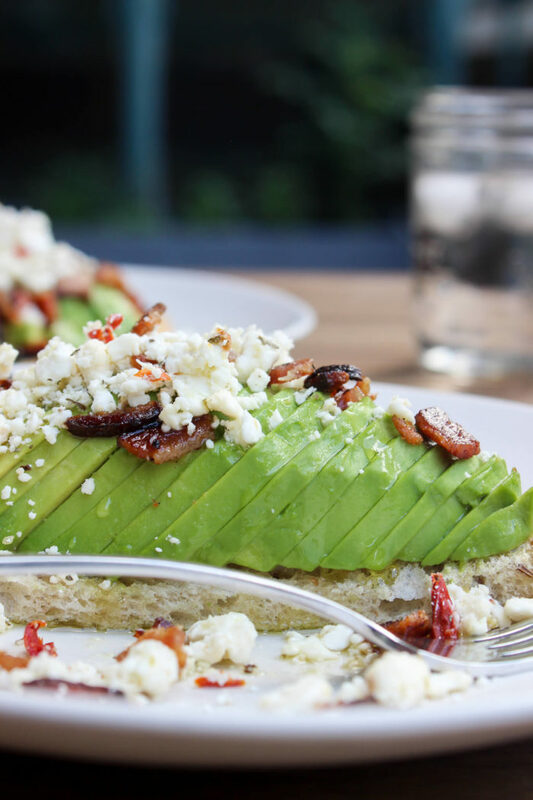 Given these qualities I figured avocado + feta would be a killer combo, so that’s where this recipe begins. Grab you favorite bread — rye! obviously — and toast it however you like. 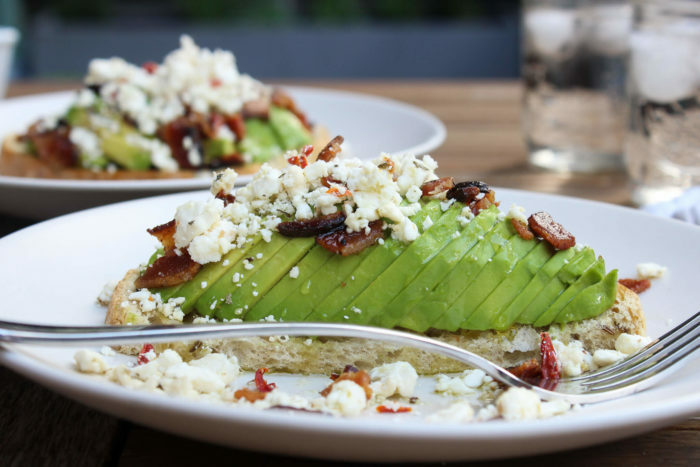 Next halve, pit, and slice the avocado, then start preparing the feta. For an ultra-Mediterranean vibe I mixed the feta with sun-dried tomatoes, basil, oregano, and garlic powder, which creates a FLAVOR BOMB of deliciousness. The taste is super fresh and adds a real summer vibe to this toast, you’re honestly going to want it on everything. 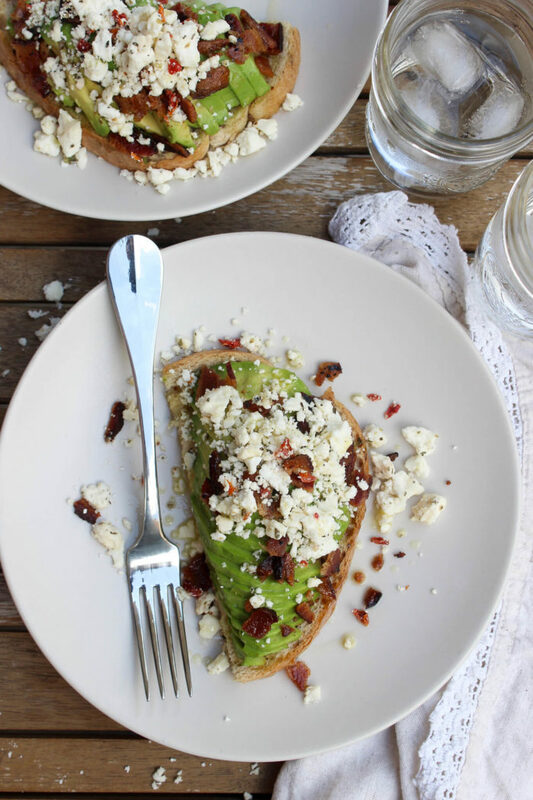 Once that’s done, simply build your toast with avo, salt & pepper, herbed feta, CRUMBLED BACON — !!!! — and a healthy drizzle of olive oil. 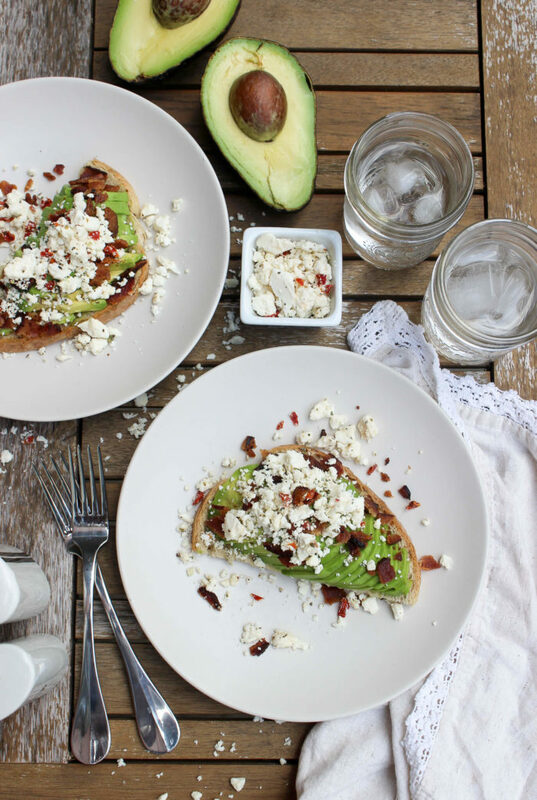 In <10 minutes you’ll be eating posh AF avo toast right in the comfort of your own home, no exorbitant price point required. Clearly this is great for weekends, but I love it during the week, too. Simply skip the bacon M-F (we need to be strict sometimes) and this is still crazy delish. 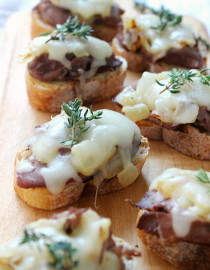 And with a little prep, this is super easy to make for a crowd, too! Make the feta and crumbled bacon ahead of time — just store it in the fridge — then plate everything to serve when your guests arrive. Toast the bread to your desired level of crispiness. Meanwhile, halve, pit, and slice the avocado. In a small mixing bowl combine the feta, sun-dried tomatoes, basil, oregano, and garlic powder, tossing gently to mix. Build your toast with sliced avocado, seasoning with a pinch of salt & pepper. Next top with the herbed feta, bacon, and a healthy drizzle of olive oil, then EAT!